Waltzingmouse Stamps - February Release Blog Hop! Hello friends and welcome to release day! If you are hopping from Jeanne's blog, you're in the right spot. If not, head over to Claire's blog to get started! I hope you've had fun during the previews the past few days - I sure have! There were so many neat tips and tricks the DT used for their projects (who can forget the vellum or the yummy Sakura markers?! ), I know I'll be incorporating some into my future projects! 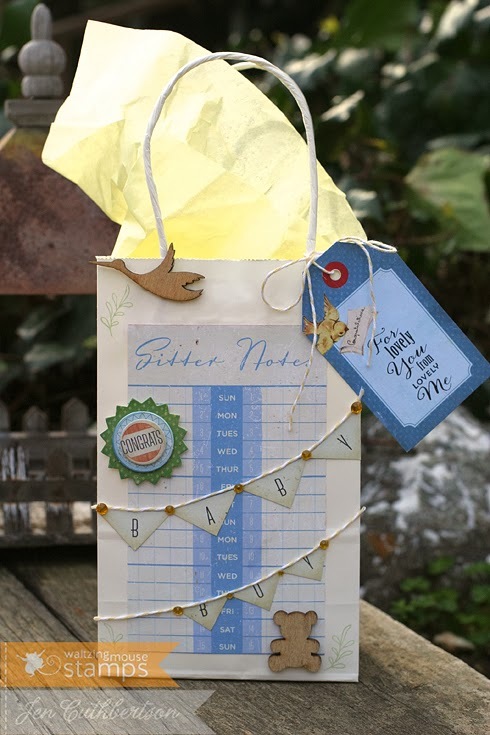 For my project today, I made a gift bag for a new parent of a baby boy! I took a white gift bag and gussied it up with some patterned paper and a little banner trimmed with some rhinestones. 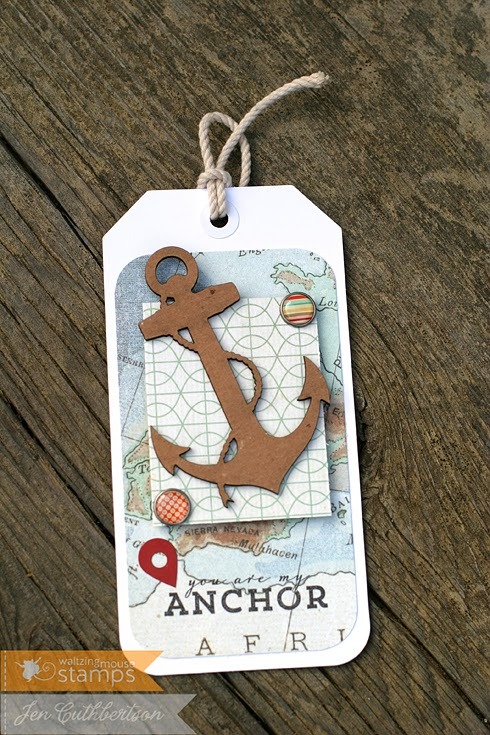 I added some little wooden shapes and tied on a tag stamped with one of the fabulous sentiment from the set. I took one of the coordinating papers from the collection and made a wee envelope using the new envelope die and added a card (cut from the gift card die) stamped with words that would be absolute heaven to my ears! Are you listening, honey?! :) I think it would make an adorable gift for a new parent complete with something for baby inside of the bag. Cute! In all seriousness, I am getting a "mom's day out" on Sunday with my friend Jamie and we're going for brunch and pedis before the Oscars. On such a glam day, we all deserve a little bit of pampering, right? 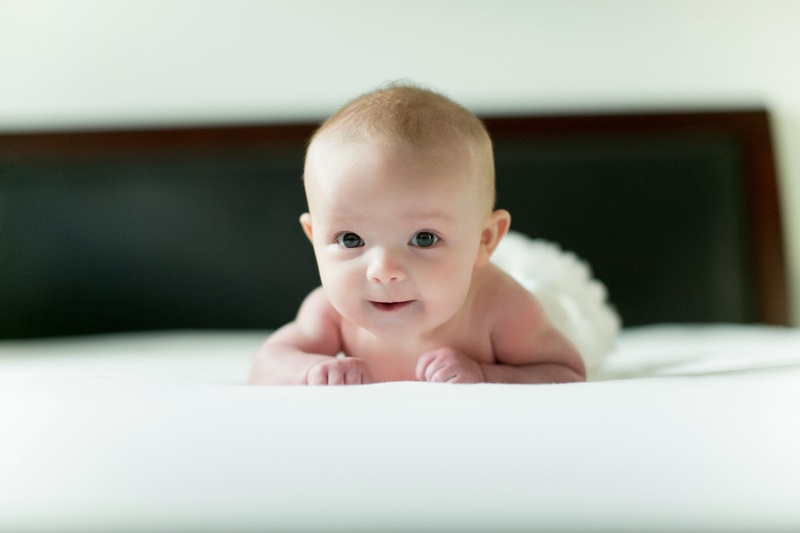 And, one last shot of the little…We had a photographer come to the house for a little shoot in December. Be still my heart. Here are the rest of the DT participating in today's hop! Thanks so much for visiting today! Jen Cuthbertson - you are here! Waltzingmouse Stamps - February Release Day 3! Hello friends and welcome to the final day of the February release previews at Waltzingmouse Stamps! Tomorrow is release day where you will be able to see the Gift Card It suite of products in their full glory! Yay! Today I want to show you, as you've seen all three days so far, just how versatile this stamp set is! I will be using the sentiments on all kinds of cards and tags like this one! I started off with a large shipping tag that I layered with some patterned papers, some bits of washi tape and some old fashioned tear-off stamps. Does anyone out there remember pass book stamps - the lick and stick variety? 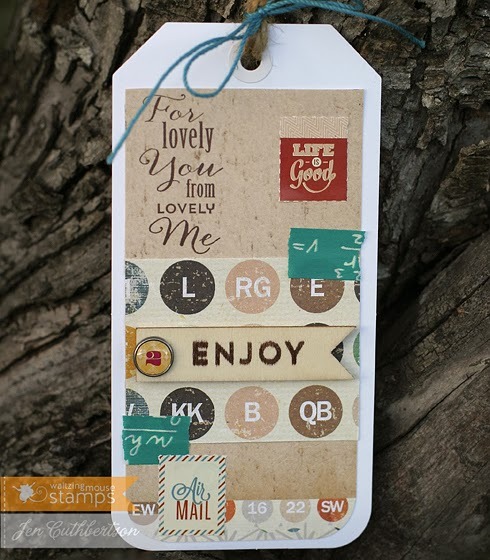 Well, these from Basic Grey are very similar and very fun to use (yes, I licked them…) :) I stamped one of the sentiments on the tag and another on the balsa shape and stuck that to the tag with a decorative brad. Waltzingmouse Stamps - February Release Day 2! Hello friends and welcome to day 2 of the February release at Waltzingmouse Stamps! Did you love what you saw yesterday? I just know you will find this set/dies as versatile as I do! Inside of the little envelope is a card I cut with the card die and stamped it with two other sentiments from the set. 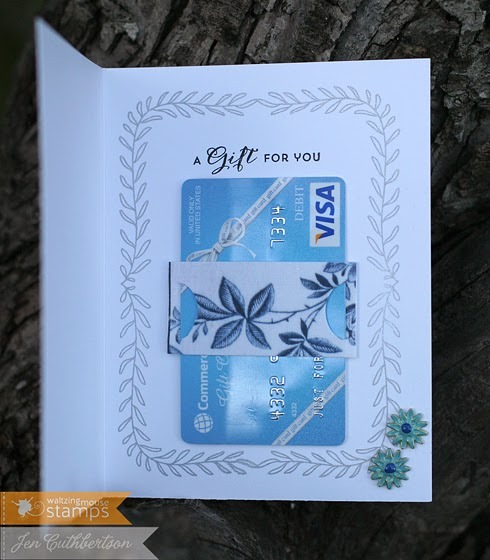 I think this will be such a fun card to get and a fun way to present handmade gift cards. Squishy hugs are a great gift! Waltzingmouse Stamps - February Release Day 1! Hello friends and welcome to the first of three days of previews for the February release at Waltzingmouse Stamps! 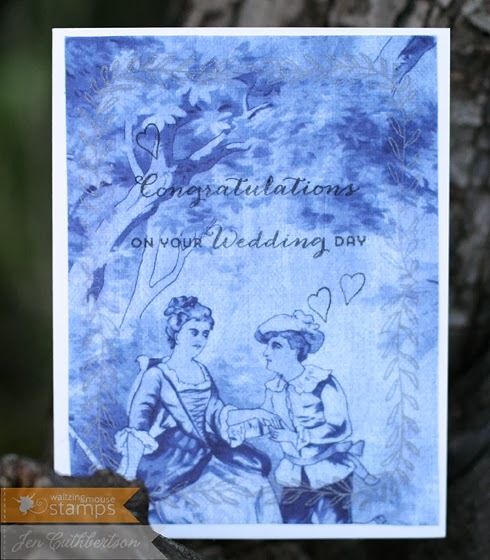 I am so excited about this stamp set and dies and know you will love them as well! For my first project I made a wedding card as we had some very close friends get married this past weekend and had a wonderful time celebrating with them on Saturday night. It was our first official "date night" since Amelia was born and we really enjoyed ourselves! Grandma and Grandpa loved babysitting, too, so it was a win/win! :) Anyway, I tried something new and used some adhesive-backed fabric for the front of the card. It was really easy to cut but I think I wouldn't remove the backing next time and just glue it on the card base. Once the backing was off, the fabric shifted and bubbled and it was a challenge to get it on the card! Once it was on (*phew*), I stamped it with the large wreath die from Gift Card It in silver ink and stamped a sentiment from the set as well as the little hearts. I cut the gift card holder from the Gift Card It die set from a piece of coordinating fabric and slipped in a gift card. I finished decking out the inside of the card with the wreath stamp and some metal buttons. I really like how this turned out! Hello friends! I know I haven't blogged in a while when the only comments I'm getting are spam, lol! I really hoped I could get back in the groove once Amelia started daycare but between work and wanting to spend time with her, crafting has really fallen by the wayside. NOT because I don't want to because I feel my soul searching for that creative outlet I used to have but simply because there aren't enough hours in the day. I stamped a background with a swirly Verve stamp and then stamped the sentiment and the flowers with one of my favorite sets, Love's Flower. Gotta run, baby is waking up and she's got a date with a bulb syringe! :) Have a great day and thanks so much for visiting! Here's a project, I've got up at the Waltzingmouse Inspiration Blog today. Head over there to see the details and for lots more WMS goodness!